Edible Arrangements Watermelon Bouquet Review! Thank you to Edible Arrangements for providing me with a sample to review. 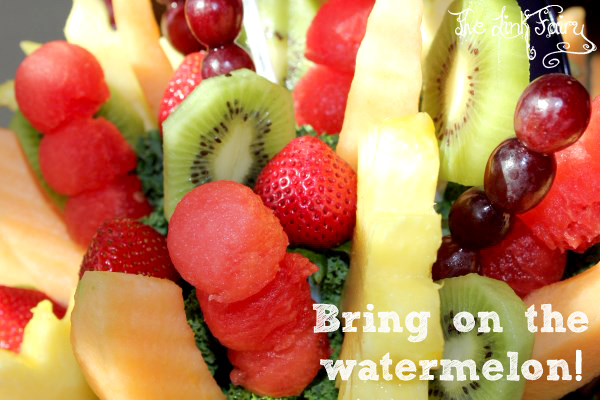 I know when I think of Summer, nothing seems to embody the season more than beautiful fresh fruit, especially watermelon! With National Watermelon Day being August 3rd, there’s no better way to celebrate this fun Summer staple than with a beautiful fruit bouquet from Edible Arrangements! Edible Arrangements uses only the best and freshest fruit of the seasons to create gorgeous edible bouquets and gifts that are sure to brings a smile to any fruit lover. We were given the chance to try out one of their new watermelon arrangements, the Watermelon Kiwi Summer Bouquet and I have to say, it was BEYOND stunning! The bouquet featured chunks of kiwi, red grapes, pineapple suns, strawberries, cantaloupe, and lots of watermelon all nestled into a decorative tin basket. Each piece of fruit seemed to stand out on it’s own and the bouquet displayed beautifully. It wasn’t long before the kiddos and I just had to dig in! I can safely say, that I have never had watermelon that was as juicy and flavorful as the watermelon in this arrangement. Honestly, I’m not a huge watermelon fan, but this was awesome! My daughter seemed to favorite the strawberries, while my son and I went after the watermelon, kiwi and grapes the most. The pineapple was great, but with the sun cut outs, there isn’t much left to be eaten around the center. My family and I thoroughly enjoyed picking our favorite fruits from the gorgeous bouquet. From the moment it came through the door till the last piece of fruit was eaten, it put a smile on all of our faces. 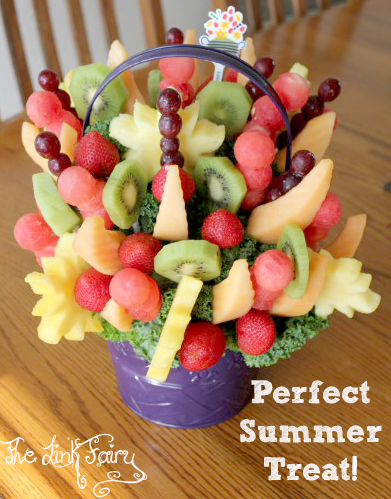 If you are looking for a great way to celebrate National Watermelon Day, friends, family or just Summer in general, Edible Arrangements can make it happen! Be sure to check out all the fun Watermelon themed arrangements at EdibleArrangements.com ! Follow Edible Arrangements on facebook and twitter to stay up to date on the latest products and promotions! I like and recommend Edible Arrangements. Their chocolate covered mandarins and strawberries are the best treat on earth. Ive always wanted to send one to someone, but I wasn’t sure about the quality. thank you so much for the review! You should investigate the owner’s financial support of Hamas, Hezbollah, and the Muslim Brotherhood and how he tried to alter contracts with his franchisees while you enjoy your watermelon.